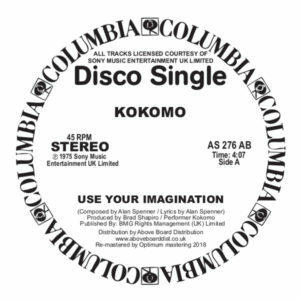 ‘Use Your imagination’ by ‘blue-eyed’ Funky rock combo Kokomo is a deep cut from the pre-Disco era of 1975. A time when uptempo R&B and Rock records like this were de rigueur with DJ’s and dancers on the dancefloor’s of clubs across NYC and all major cities where ‘proper’ dance music was appreciated and taken seriously. The years leading up to the Disco boom blessed us with some fantastic records like this that carried over into that late 70’s era, ‘classics’ that still got love from the DJ’s and were sequenced alongside the hits and anthems of the day. Featuring members of Joe Cocker’s Grease Band, Kokomo had a few hits and were widely known, ‘Use Your imagination’ though, was their nightclub classic, a breezy, jazzy and funky jam that rolls just right and is incredibly rare and sought after on promo 12″. Backed here with an exclusive unreleased edit on the flip you know this is an essential if you’re a true Disco-head! This repress of the original Columbia promo from 1975 is backed with a brand new re-edit from one of NYC’s Disco kings – Mr.K aka Danny Krivit. With almost half a century spent behind the turntables in NYC and beyond he surely understands records like ‘Use Your Imagination’ intrinsically, he was, after all, there when it all happened! This classic has been legally reissued by Above Board distribution in conjunction with the legal rights holders – Sony Music Entertainment. This high quality repress features original white label Columbia label Disco 12″ artwork and has been remastered from Sony’s original sources by Optimum Mastering, Bristol UK.